So in competitive it shows symettra as being my top hero. 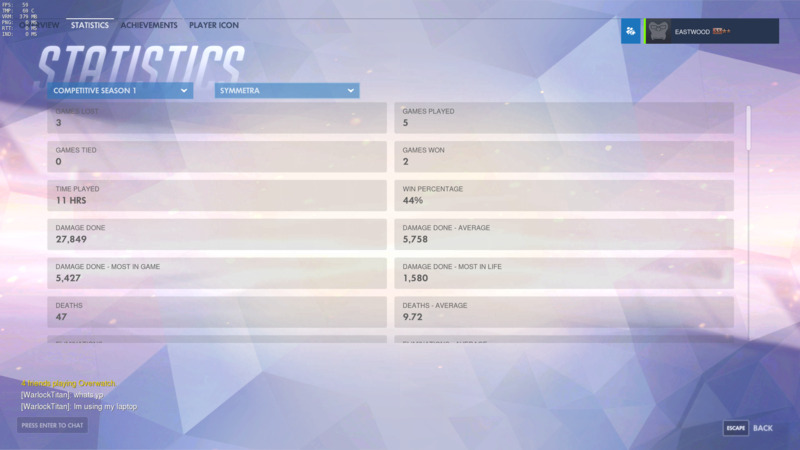 I'm going to be throwing blizz a support ticket about season one but if you look you'll see i have only ever played 8 games as symettra in both seasons and it shows 11 hours on her. This isn't true of course. I was hoping it'd be gong with this season but now it's showing 6 hours played as her (which is actually zero) and is my top character when my total play time in comp is 6 hours. It's kind of hard to explain but just look at my competative stats/history and you'll see. ZelgadisXI said:Fixed! Thanks for all the info. Awesome, thanks! I don't think I could've done another season with symetra looking at me with that smug face lol. Update issue, so i got 58 solo kills with pharah on comp season 2 and the #1 global youre showing is 35, i have 23 more than that and i wish to brag to my friends, also your update only shows 16 solo where on my game it shows 58, thanks in advance. Reliableplum said:Update issue, so i got 58 solo kills with pharah on comp season 2 and the #1 global youre showing is 35, i have 23 more than that and i wish to brag to my friends, also your update only shows 16 solo where on my game it shows 58, thanks in advance. I'm showing 246? Am I looking at the wrong thing? My page (on QuickPlay) says my main hero is Junkrat, even though I have more hours on Dva? Also, it doesn't show Dva at all in the heroes I've played. My win percentage shows 0% for multiple days. However my skill rating went up in each case. The information isnt being pulled correctly since I have clearly been winning these days. Also what are the 2 Miscellaneous categories I am showing 4 Multikill, 9 overwatch.guid.0x086000000000042D, and 35 overwatch.guid.0x0860000000000430. I checked battle.net and they have the same issue it looks like. On another note can we get a damage blocked average? I main Rein and I feel this would be nice to know. Going into the my stats tab and clicking on my account name stats gives me an error that just says something went wrong contact system administrator. Am I missing something, because it appears either the cumulative distribution graph for skill rating is incorrect or the "Top x%" stat on your profile is wrong. I am 2899 and my profile under competitive says that is top 9%, but if i find 2889 in the graph I get a percentage of 89, meaning I am in the top 11% surely? Another example is one of my friends is 2520, and his profile says top 27%, but on the graph 2520 is about 69%, or top 31%, so the graph seems to be a bit inaccurate. Also if viewing a profile under quick play it shows and incorrect value for top %, it seems to be a third of your comp top %. When I go to my profile, it shows that Junkrat is my primary hero for quickplay, even though it is Dva. Dva isn't even listed at all. When NOT playing on a certain day, the graph of Performance Tracking will still show a data point at zero. While that is actually correct it seriously messes up the trending line connecting the data points. Numbers of losses for a hero in QP is wrong. The numbers of wins is correct though AFAIK. For me on lucio it shows 81 wins / 4 losses. GO ME! It should be 81/72 though. Now they are showing 14. I don't know what's going on. Are you seeing same thing? My account says I have 55 wins and -55 losses on Tracer. The leader boards seem to be a mix between season 1 and season 2 numbers. At least when you select a specific category. Is there anyway to separate the leader boards into different competitive seasons?